To be fair, I’ve read tons of good things about dinner in okb… and granted I was there at its opening on a weekday so the selection was extremely limited. It’s still a place worth checking out if you are in the Everton Park area which is a hotspot for little independent businesses like Highlanders Coffee, Strangers’ Reunion, Chef Icon Bakery, Grin Affair, Nylon Coffee Roasters etc. I support all local businesses so yes I think my previous review was a little harsh and unbecoming 😉 And on hindsight I really think too much when I eat gosh. ahaha. Our visit to okb was quite disappointing- given the rave review on the Sunday Life! I guess I was expecting much more. The execution was not clean to me and being ‘classics’, comparisons came quickly to mind which unfortunately, none of the creations I tried could match up to. The cinnamon roll was soft but there simply wasn’t enough glaze and sugar-cinnamon in between. The lemon tart was possibly one of the worst I’ve tried. The crust was overly browned- tastewise dry, not buttery at all. The scone with raspberry jam swirled inside was possibly the nicest of the lot. But the generic flavours made it very very unimpressionable and it was very very tiny. We spent $7.50 for all these and they were really small. To help with perspective, the plates were saucers… Service was unenthusiastic bordering on cold, but maybe it’s because we caught them close to opening time at about. Cinnamon roll: Simply bread’s sticky bun, or Square buns junior which is not too bad. If you are a homebaker, try flour bakery‘s recipe cuz so far my favourite cinnamon roll is from that lovely bakery in Boston. 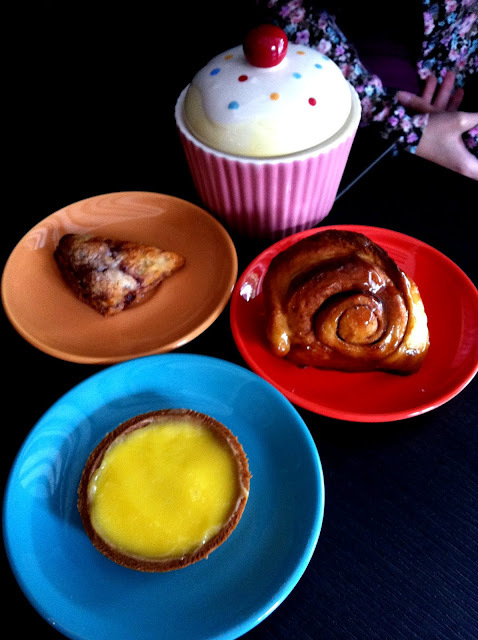 lemon tart: marmalade pantry’s lemon tart (brûlée-ed top), Carpenter & Cook’s lemon cream tart (it’ll make u pucker! I personally prefer their passionfruit meringue tart for the balance in flavours) and Baker & Cook’s lemon tart (small, expensive but perfectly executed in terms of aesthetic and taste).